what is going on in this house, but I don’t like it. Like many wealthy British mothers and fathers, Maud—far too self-involved for parenting—kept her daughter at a distance, often putting her under the care of punitive nannies. Throughout her engaging biography Gordon expresses Nancy’s later inability to develop a lasting relationship and her desperate need for love as the result of this distant, even frigid relationship between mother and daughter (the biographer is perhaps at her weakest when she attempts psychological analyses of her subject). Yet as Gordon herself notes, Maud had grown up in just such a household, and one has only to read a handful of British (and American) biographies of wealthy families to know that many, if not most of such children were treated similarly. Nancy, born on March 10, 1896, grew up to be a stunning beauty with piercingly blue eyes and a graceful, almost musical way of walking, was one of the most popular young women of her day both in pre-World War I England and, even more so, in postwar Paris. As her black American lover, Henry Crowder, would later describe her sexual appetite, she slept with everyone and anyone, from noted writers, musicians, and artists of the day to bellhops, chauffeurs, bartenders, nearly anyone with whom she might come in contact. Gordon even suggests that Nancy might have undergone a hysterectomy connected with an abortion or to prevent herself from becoming pregnant. of a long suffering people. Gordon suggests that that event, her continued financial woes, her shock at the silence of the Allied countries with regard to Spain, and her deteriorating health led, ultimately, to a brief mental breakdown and incarceration in an institution, her friends arguing that Nancy was not mad as much as mad about life. Cunard’s life clearly had been one lived at high pitch, and the passionate commitments to social and literary causes had been met primarily with silence and scorn. Despite her continued friendships with notables throughout the world and an embracement of younger friends such as Philadelphian Charles Burkhart, Cunard’s body and mind continued to decline during her last years. In her final hours in a cheap Paris hotel—having refused to accept refuge in the home friends, fearing that she would become an imposition to them—she could barely climb the stairs to her room, and events became almost surreal. Yet throughout her life she staunchly stood as a beacon of joyful living, social commitment, and moral courage that one rarely finds combined in a single individual. 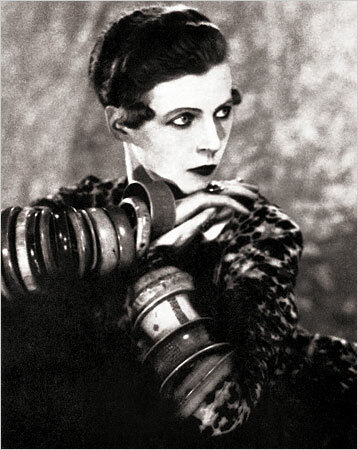 [The material in this essay was based on Lois Gordon Nancy Cunard: Heiress, Muse, Political Idealist (New York: Columbia University Press, 2007) and written as a review in 2007. Under a poplar; the proud grapes and the burst grape-skins. And a pale sky with a sickle moon. Thin winds undress the branch, it is October. "Il est fatigué, depuis douze ans toujours dans le même coin." In Aix what's remembered of Cezanne? A house to let (with studio) in a garden. And if it doesn't suit, we, Agence Sextus, will find you another just as good." And took no rest, and has no epitaph. And in San Gimignano's towers where Dante once ..
And Signorelli, the austere passion. From that last rim of amaranthine sky. You can foretell the worm between the bones. Signed with the Italian star. I had you to myself then ....."